Today will be a short post since I have Back To School Night tonight. I job share so I am at home today and will go back to my school site later today to get the classroom ready. I wanted to share a little about our first 2 weeks in implementing Daily 5. If you have not tried Daily 5 and have been on the fence about it, I would really encourage you to DO IT! I LOVE it and it really is my favorite time of the day. In fact, my sweet little Daniel from my class (and a couple of other students) kept asking when we were going to do Daily 5 again. 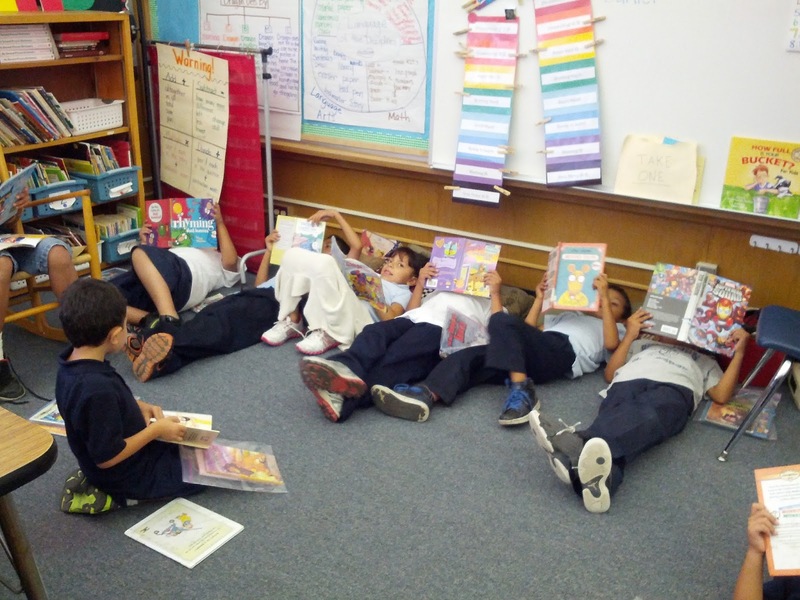 They know that it's at the end of the day, but they were just SUPER excited to do Read to Self since they had earned sitting ANYWHERE in the room. Note: this year, I have a tough and SO VERY chatty class so I was a bit scared to see how "sitting anywhere" would turn out. 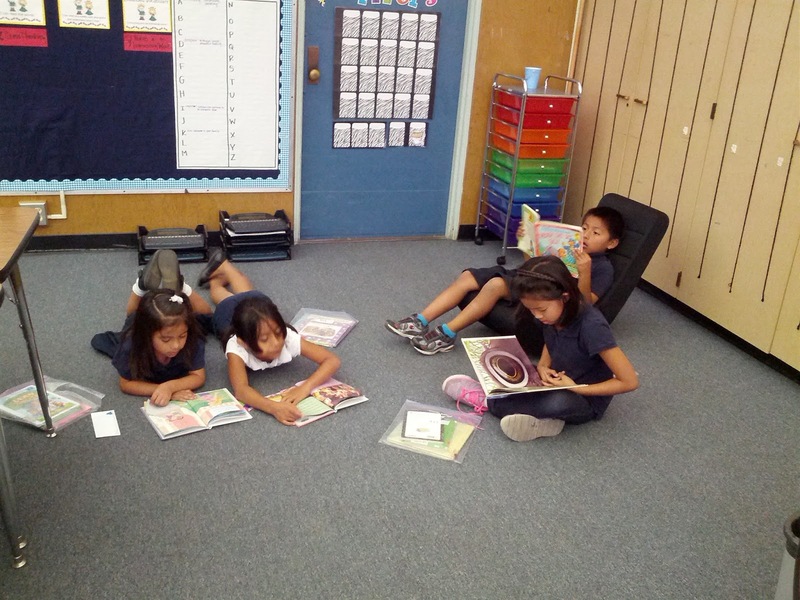 I start my Read to Self with them just sitting at their desks. I wanted them to build some stamina in displaying the right Read to Self behavior before I threw in the fun factor of sitting around the room, under the tables, at my teacher desk, etc. 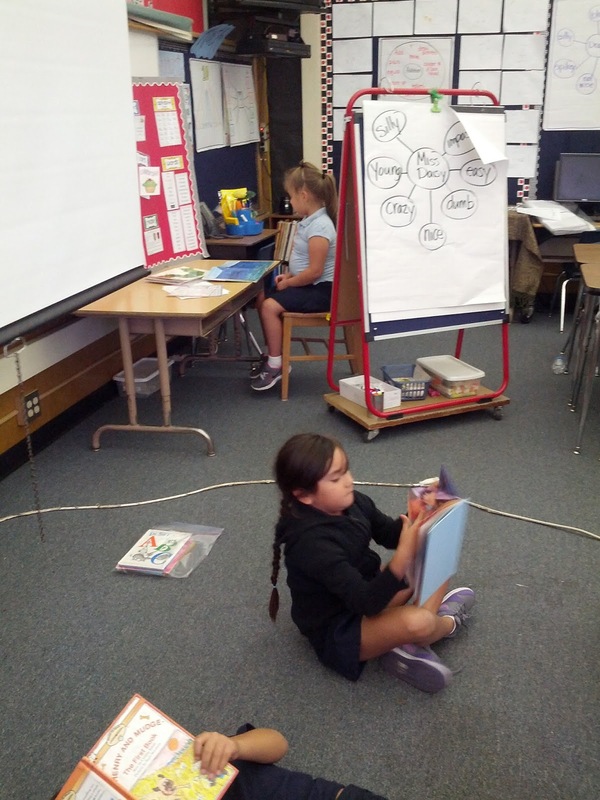 I told them that if they made it to 6 mins, that I would allow them to sit anywhere in the class. They worked together and within just a couple tries, they did it. WOW! To be honest, I didn't think that they would get it that soon, but I am a woman of my word.... so I allowed them to sit anywhere they wanted... even under the desks....which I had to take back because they just weren't ready for THAT much fun this early. Ha! Well, I guess the excitement was just too much because our first try of sitting anywhere got us a whopping 16 seconds before someone was off task! I stopped them and they came back to the gathering place. 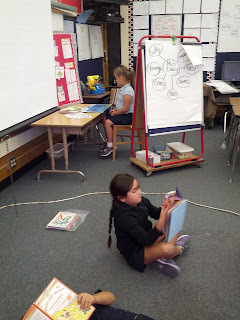 We talked about what we did, we assessed ourselves with a thumbs up/down, reviewed our anchor chart, and tried again. This time I heard my students whisper to each other, "Come on guys, let's do it!" and "NO talking (insert name here) and "Ok, read the WHOLE time (eyes one the usual suspect who usually does not)." So we tried our round 2 of Read to Self and we made it 4 mins and 38 secs! They would have gone longer, but it was time to clean up so I stopped them (insert student groans here). They did great and I seriously was SO impressed by their teamwork in reaching this goal. 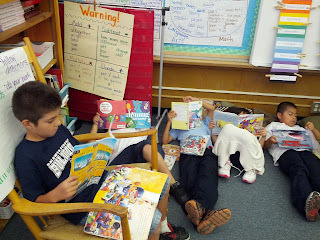 Here are some shots from our Read to Self. Kids love sitting in our rocking chair. Love their little crossed legs! We will continue working on stamina and introduce Read to Someone next week. I know that my students last year really loved reading with their friends. Like I said, this class is making me earn my keep so I am a bit nervous about introducing this component. But I know that with a lot little bit of work and hair pulling patience, I can get them there. Maybe I'm a bit weird, but I LOVE it when kids are reading all over the place! I hate having desks (or actually any furniture) cluttering up my class, so having the kids sprawled out all over the place is great. All the best with your lot this year! !